免责声明： 本 EOS.IO 技术白皮书草案仅供参考。 block.one does not guarantee the accuracy of or the conclusions reached in this white paper, and this white paper is provided “as is”. block.one does not make and expressly disclaims all representations and warranties, express, implied, statutory or otherwise, whatsoever, including, but not limited to: (i) warranties of merchantability, fitness for a particular purpose, suitability, usage, title or noninfringement; (ii) that the contents of this white paper are free from error; and (iii) that such contents will not infringe third-party rights. block.one and its affiliates shall have no liability for damages of any kind arising out of the use, reference to, or reliance on this white paper or any of the content contained herein, even if advised of the possibility of such damages. In no event will block.one or its affiliates be liable to any person or entity for any damages, losses, liabilities, costs or expenses of any kind, whether direct or indirect, consequential, compensatory, incidental, actual, exemplary, punitive or special for the use of, reference to, or reliance on this white paper or any of the content contained herein, including, without limitation, any loss of business, revenues, profits, data, use, goodwill or other intangible losses. EOS.IO 软件使用唯一能满足区块链之上应用性能需求的去中心化共识算法，委托股权证明 (DPOS)。 Under this algorithm, those who hold tokens on a blockchain adopting the EOS.IO software may select block producers through a continuous approval voting system and anyone may choose to participate in block production and will be given an opportunity to produce blocks proportional to the total votes they have received relative to all other producers. For private blockchains the management could use the tokens to add and remove IT staff. 另一个例子在 Steem 区块链中，它包含三个硬编码的命名权限级别：拥有，活跃和发帖。 发帖权限就只能进行如投票和发帖的社交活动，而活跃权限可以做除了变更拥有之外的所有的事情。 拥有权限的意思是冷存储并且有能力做任何事。 The EOS.IO software generalizes this concept by allowing each account holder to define their own hierarchy as well as the grouping of actions. 时间是安全中的一个关键组成部分。 在大多数情况下，一个私钥在没有被使用前都无从知晓它是否被偷窃。 当人们有需要密钥的应用在每天联网使用的电脑上运行时，基于时间的安全会更为重要。 EOS.IO 软件让应用开发者可以指明消息必须在被加到一个区块之前等待最小的时间间隙。 During this time they can be cancelled. A holder of tokens on a blockchain launched adopting the EOS.IO software who may not have an immediate need to consume all or part of the available bandwidth, can give or rent such unconsumed bandwidth to others; the block producers running EOS.IO software on such blockchain will recognize this delegation of capacity and allocate bandwidth accordingly. EOS.IO 软件的一个主要优点就是应用可用的带宽完全独立于 token 的价格。 If an application owner holds a relevant number of tokens on a blockchain adopting EOS.IO software, then the application can run indefinitely within a fixed state and bandwidth usage. In such case, developers and users are unaffected from any price volatility in the token market and therefore not reliant on a price feed. 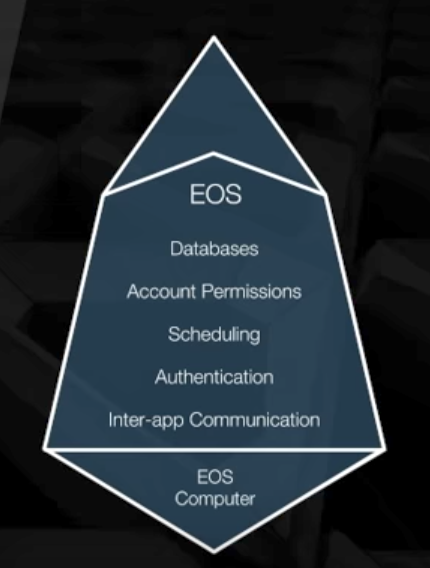 In other words, a blockchain that adopts the EOS.IO software enables block producers to naturally increase bandwidth, computation, and storage available per token independent of the token’s value. It is the intention of the EOS.IO software-based blockchain that multiple virtual machines can be supported and new virtual machines added over time as necessary. 因此，本文并不讨论任何特定的语言或者虚拟机。 That said, there are two virtual machines that are currently being evaluated for use with an EOS.IO software-based blockchain. 这个虚拟机已经被众多已有的智能合约所采用并且可以通过适配应用与 EOS.IO 区块链中。 It is conceivable that EVM contracts could be run within their own sandbox inside an EOS.IO software-based blockchain and that with some adaptation EVM contracts could communicate with other EOS.IO software blockchain applications. 当与外部区块链进行通信时，区块生产者必须等待直到 100% 确信一个交易已经被另一个区块链确认为不可逆后才会接收它成为一个有效的输入。 Using an EOS.IO software-based blockchain and DPOS with 3 second blocks and 21 producers, this takes approximately 45 seconds. If a chain’s block producers do not wait for irreversibility it would be like an exchange accepting a deposit that was later reversed and could impact the validity of the blockchain’s consensus.